Motsenbocker's Lift Off #5 Latex Based Paint Remover is a water-based and biodegradable product, with a Green Cross Certification. This means that it is a environmentally safe product, that is biodegradable, and has low VOCs (Volatile Organic Compounds). It was designed to specifically remove latex based paints from all surfaces including carpet, clothing, upholstery, brick, concrete and more! 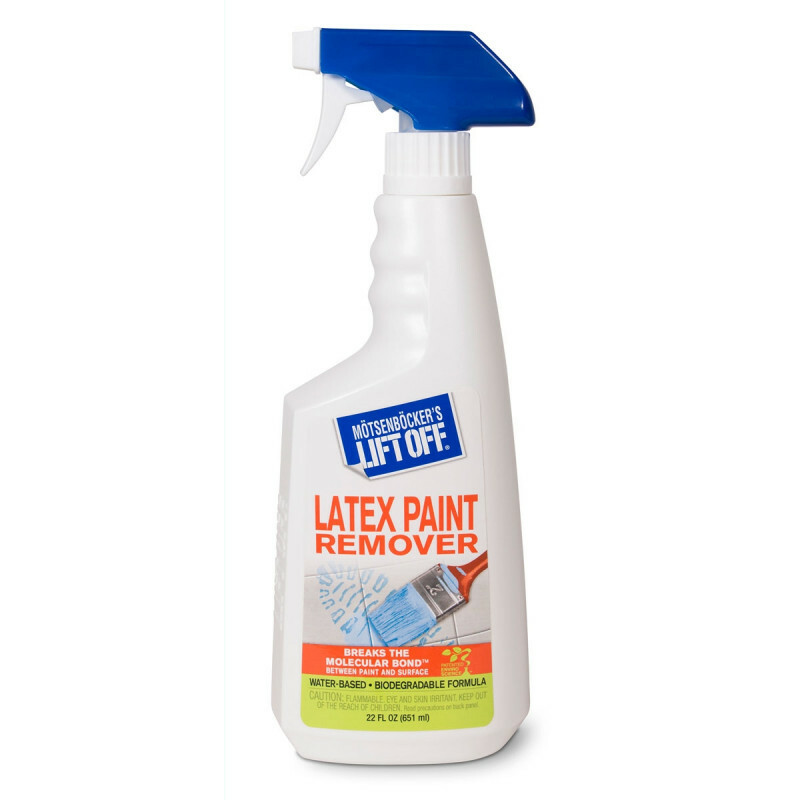 Lift Off #5 works great for all latex based paint clean up from tools to overspray. For other options, including graffiti removers, take a look at our complete line of paint and vandalism removing solutions. Always test all paint removal products on an inconspicuous area, before applying to entire area. Not recommended for use on latex painted walls, non-colorfast materials or woodwork. - "Gwen from the Stafford Department of Corrections stated, "Your Liftoff #5 is a terrific product - we recently had cells in our jail painted with latex paint over an epoxy base and the #5 is doing a great job of pulling up the latex without damaging the epoxy." Test for colorfastness by spraying an inconspicuous area. Blot/wipe wet paint spot thoroughly with a clean, white cloth or paper towel. Spray paint spot thoroughly; wait at least 60 seconds. Gently agitate (use brush if necessary) to loosen dried paint, then wipe or blot thoroughly with clean, white towel or cloth. Repeat if necessary. For best results on non-washable materials, dry with hair dryer on medium heat. Agitate if necessary (the back end of a tooth brush works well). Repeat if necessary. Launder as fabric recommendations allow. Apply according to the instructions above. Place a clean, white cloth or paper towels over the treated area, followed by something flat and heavy like a phonebook. In a few hours, the towel will absorb any excess stain dampness or residue from the stain. Use brush or cloth to agitate (loosen) dried paint. Wipe with clean towel, or if possible, rinse off. Repeat if necessary. Customers who were interested in the Motsenbocker's #5 Latex Paint Remover - 6 Bottles were also interested in the following items. This is a review for the Motsenbocker's #5 Latex Paint Remover - 6 Bottles.